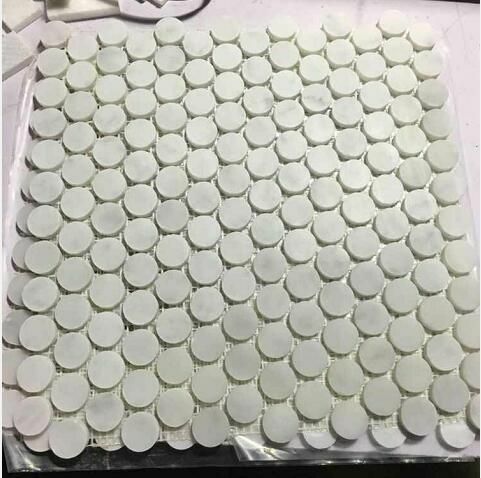 Honed Carrara Marble Mosaic - Carrara marble mosaic supplier in China supplies Carrara marble mosaic, round stone mosaic tiles, customized, for bathroom & swimming pool decoration. Carrara marble mosaic supplier in China supplies Carrara marble mosaic, round stone mosaic tiles, customized, for bathroom & swimming pool decoration. 4.Usage: Swimming Pool, Wall Decoration. Shape Hexagon, square, round, rhombus, irregular, strip and etc. Surface finished Polished, honed, tumbled, antiqued, brushed, water-jet and etc. Usage Suitable for hall and flooring, wall and table decoration or any other location that may need artistry in stone. Quality Assurance During the whole production process, from material choosing, fabrication to package, our quality assurance people will strictly control each single and every process to ensure quality standards and punctual delivery. Beige marble factory in china provides beige marble, cream beige marble tile, light beige marble for wall or floor decoration, bathroom vanity sink. China bush hammered granite manufacturer offers G602 Chinese granite, China grey granite, bush hammered, cut to size, durable, natural stone slabs. Sandstone paving suppliers in China supplies sandstone buff paving slabs, yellow sandstone paving, slip resistance, floor tiles, carefully calibrated. Iran silver travertine supplier in China provides Iran silver grey travertine tiles, silver travertine stone slabs, suitable for wall floor decoration. Top china stone factory, china stone supplier & exporter, hangmao supplies high quality natural stone, granite, marble, basalt, pebble, slate, etc.